This easy Buttermilk Banana Bread Recipe always gets rave reviews! Some say it is the BEST banana bread recipe out there. If you have brown bananas and buttermilk to use up, make this banana bread. You won’t be disappointed. I am always trying to find new uses for brown bananas and buttermilk. I always seem to have an abundance of these two ingredients. Josh doesn’t like bananas, but I still buy them in large bunches. I have good intentions to eat them, but they always turn on me too quickly. I also buy the large container of buttermilk because it is a better deal. I usually use the little bit I bought it for and wait until it is about to expire, then everything we eat involves buttermilk. Last week, I was thinking of ways to use up bananas and buttermilk and decided to bake Buttermilk Banana Bread. I was able to use up my brown bananas and some buttermilk, WIN! Bananas & Buttermilk – Yum! Buttermilk and bananas are meant to be friends. They team up in this recipe to create a very moist loaf of bread. This banana bread is light in flavor and color. Itreminds me of a very moist banana pound cake because of the rich, buttery crumb. It is SO good warm with a little butter. Some say it is the BEST banana bread recipe they have ever made. It is definitely a favorite at our house! You can make muffins or mini loaves with this banana bread recipe, just reduce the baking time. The bread also freezes well. I always like having a loaf in the freezer for a rainy day…or any day! 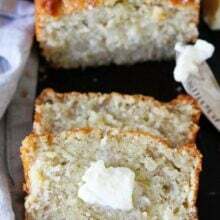 If you are pondering what to do with the overripe bananas on your counter and the buttermilk in your refrigerator, make this easy quick bread. Your house will fill with a wonderful aroma and you will have a tasty snack or delicious breakfast. Banana bread is ALWAYS a good idea. This is the BEST banana bread recipe! Everyone LOVES it! Preheat the oven to 350 degrees F. Grease a 9x5-inch loaf pan with nonstick cooking spray and set aside. In the bowl of a stand mixer or by using a hand mixer, cream butter and sugar together. Add eggs, mashed bananas, buttermilk, and vanilla until combined. Add in the flour, baking powder, salt and soda. Mix until just combined. Pour batter into prepared pan and bake for 50-55 minutes or until a toothpick comes out clean. Let bread cool on a wire rack for 15 minutes. Loosen the bread with a knife and carefully remove from pan. Let the bread cool completely on the cooling rack. Slice and enjoy! This not only sounds delicious, it is really a beautiful bread! This bread looks great, I love Mel’s site! I just read a recipe last night for banana buttermilk biscuits last night — and now this — I’m thinking the combination must be amazing! Biscuits? I might have to try them! i love buttermilk in baked goods…it’s just SO creamy and wonderful! This is making me wish I had more than one brown banana downstairs 😉 Looks great! I usually buy more bananas than I need/will use in hopes that they go bad and I can bake with them! You won a giveaway on Itzy’s Kitchen!! Oh gosh, Maria! Yum! That last shot is what did me in. It looks so moist! This looks so good! I’ve never used buttermilk in banana bread before, and am excited to try! My hubby hates bananas too, but my kids and I love them. Your bread looks great! This is so gorgeous! I have never seen such a beautiful banana bread! I adore banana bread. I have a recipe to post this week for banana blondies, that came out like a dense, delicious ‘naner bread! It looks incredibly moist! I’m going to have to check out using buttermilk in my banana bread! lovely! I’ve never made banana bread with buttermilk before…this is going to be the recipe I try next! Wow, this looks so gorgeous!! Yum! It looks and sounds so good. Buttermilk always makes things so moist! Delicious! I just bought a huge bunch of browning bananas from the store to bake with – guess I know one thing I can try 🙂 Looks great Maria! Wow! That looks gorgeous! I need to make some really soon. My little ones looooooove bread! I’m thrilled you liked this bread, Maria! I agree that I’m always looking for ways to use up those past-prime bananas! I always throw my brown bananas in the freezer for my smoothies! love the use of buttermilk! I love this recipe. We only have buttermilk in quarts around here, and I never use the whole thing. For a while I stopped buying it, and I use dry buttermilk most of the time because I hate wasting most of a container. If I do buy buttermilk, I try to have a bunch of recipes in mind that use it… so this is going on that list! You can freeze buttermilk. I put a cup in a sandwich bag, lay it flat to freeze. Yes, thanks for the tip! That is the most moist, delicious looking quick bread I’ve ever seen! What a great idea for leftover buttermilk and brown bananas. This looks delicious, Maria. I could definitely go for a slice for breakfast! I agree that bananas+buttermilk=the perfect pairing. I am imagining how it tastes warm out of the oven. Wow, that looks incredibly moist! I haven’t tried banana bread made with buttermilk but it sure sounds good! Now that looks like some delicious banana bread! Love the pictures, too! Very nice! i lvoe anything with buttermilk! yum! I’d love a piece of this! I was so proud of myself for actually using my container of buttermilk last week but now I wish I hadn’t so that I could make this! We’re on the same wavelength today, Maria! I threw together some impromptu banana buttermilk muffins for some friends who came over this morning. I wholeheartedly agree it’s a match made in heaven. Get outta my head! I just bought brown bananas at the store yesterday so I could use them with my leftover buttermilk to make banana bread! Lovely choice, Maria-it’s beautiful! I saw this recipe posted on the Tasty Kitchen blog a while back and tried it right away. It is now my go to banana bread recipe…moist, just the right sweetness…delicious. I have mixed it up by adding nuts or mini chocolate chips. I never seem to have a use for leftover buttermilk besides pancakes so I rarely buy it and instead mix milk and vinegar when a recipe calls for it. With more uses like these, however, we may end up with a large container of buttermilk! Yum! Same here. I use the buttermilk for a recipe and then what. Will have to try. Looks yummy. I love how light this looks both in texture and color. 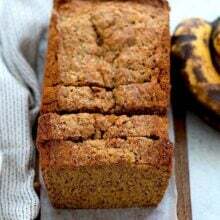 one of the best banana bread I have ever seen…this bread is looking so fresh and inviting, need to give it a shot soon ! I totally agree. Bananas and buttermilk were meant to be together! I have a few ripe bananas but no buttermilk… thankfully there is a store nearby. It looks moist and delicious. It definitely looks super moist, with a beautiful crumb. 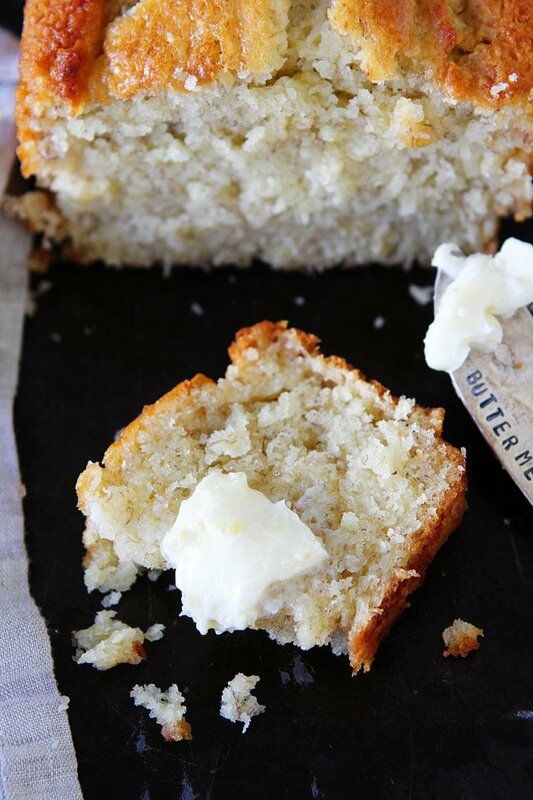 I’ve never tried banana bread with buttermilk, but it sounds like a delightful combination! Love this recipe, Maria. We make it a lot around here! Your loaves look just beautiful …have a great night! Oh too bad, I literally just made some banana bread! Wish I had seen this first. Oh well…. I’ve clipped it for next time…. This looks so moist, Maria. Great use of brown bananas. Gorgeous! I love how light and fluffy this looks. This is my favorite banana bread recipe ever!! It is so buttery and smooth and tastes perfect with a cup of coffee or a cold glass of milk. MmmmMM! I just love buttermilk…esp in baked goods. I buy the fresh, but I also by the powdered stuff, so I always have it on hand. I am going to give this recipe a go next time I have over ripe bananas in the fruit bowl! That banana bread looks so moist and delicious! What a great recipe. I love baking with buttermilk, this sounds wonderful! So, I don’t know if you’ve ever heard this- but you can actually freeze buttermilk for future use. Makes it easy to always have it on hand! Thanks for the tip! I will have to try freezing buttermilk next time. This looks delicious! I have made lots of banana bread but never with buttermilk… it seems so obvious now! And I’m the same way – always buy the quart of buttermilk but can never seem to use it up in time. Mmm, yum. This looks so light and delicious. I’ve got a new quart of buttermilk in the fridge right now. And it’s nice to know you got this to rise beautifully at high altitude. I’ll definitely try this—maybe as muffins. This bread looks lovely! I often add buttermilk to my banana bread, but it definitely doesn’t turn out as light and fluffy as yours did. I have to try this recipe! Made this tonight and it is hands down the best banana bread that has ever come out of my oven! So glad you enjoyed the banana bread! 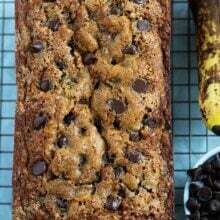 I’m not a big fan of banana bread, but my sis looooves it and she’s visiting, so I can’t wait to make this for her! Thanks! P.S. Have you ever tried buttermilk powder? I have wasted so many quarts of buttermilk, but now I buy the powdered stuff and it keeps (in the refrigerator) for a long time! It works just as well as the real stuff, and you can’t tell a difference at all. It’s made by a company called Saco (http://www.amazon.com/Saco-Cultured-Buttermilk-16-Ounce-Canister/dp/B001E5E2BS) and it’s great. This is perfect! I always have brown bananas in my freezer and I’ve got the big container of buttermilk in my fridge at the moment. Thanks!! I had six very very overripe bananas so i doubled the recipe and made these into muffins instead. It was far too sweet though. I was looking at the amount of sugar before i put it in the mixer and thought that those measurements couldn’t be right. So i took out a half cup and thought that would do the trick. But it didn’t, it was still really sweet. I think next time i’ll use less sugar and maybe half that portion with brown sugar and white sugar so i can have more flavor. I baked these muffins at 350 degrees F for 20 minutes, the inside was perfect, but i didn’t get that nice golden crust i was hoping for. So i think it would be better (just for muffins) to increase the temperature to 375 degrees and lower the time to about 15 mins. I made this yesterday. I used a cake pan because it seems to last longer when I put it out for snacking. I just reduced the bake time to about 40 minutes. It was the most moist, flavourful banana bread I’ve ever made. There wasn’t any of the dry outer crust that I usually get in my other recipes, and it wasn’t too sweet. I stuck a slice in the toaster over to crisp up a little more and had it with cream cheese for breakfast. Seriously tasty! Great idea to use a cake pan. Glad you liked it! I made this bread on Saturday and it was AMAZING! I added a 1/2 cup of blueberries and pecans. Just lovely! Luckily I took one last look at the recipe because I had put all the batter in one 8 1/2 x 4 1/2 pan and popped it in the oven. What a disaster that could have been! I quickly pulled the bread out of the oven and removed some batter to put into 2 mini round cake pans. Will certainly make this again!!!! Such a classic! Great additions! Glad you liked the bread! I just made these for for breakfast for my girls, but I made them as mini donuts and added peanut butter frosting to the not breakfast half of batter. They are great. This is the best tasting banana bread I have ever had. I baked at 350 for 12 min. Girls were litterally lined up waiting for each batch to cool. (I only have one pan to be able bake 12 at a time.) They said it is a keeper! Love the idea of making mini donuts. So glad you enjoyed the recipe! Buttermilk; freeze leftover buttermilk in 1/2 cup portions laying flat in freezer bags. I don’t like to drink it, but it’s great for baking. It will be in your freezer when you need it. This bread is DELICIOUS! I made it for my twins, but I ended up eating most of it. Whoops. I wrote about it in my blog, would love some visitors! Thanks! It is one of my favorite recipes as well. I continueously try new banana bread recipes and this is one of the best. I added walnuts. Glad you are enjoying our recipes! One question….do you think subbing applesauce would work for this instead of the butter? I have done that with cakes and cupcakes before, but didn’t know if it would change the texture/consistency of the banana bread. I haven’t tried the recipe with applesauce. Maybe start with half applesauce and half butter and see how it goes. Let me know! Did you know that if you separate your bananas at their tops when you buy them, they ripen slower? I live in a really hot, humid climate and i could never keep on top of my bananas ripening. Though since I started separating them we almost always get them eaten. Thanks for the banana tip! Of all the MANY banana recipes posted on Tastespotting today, your bread looks the most divine. Beautiful!!! It’s easy to overlook yet another banana bread recipe because there are so many out there, but you must make this one! It is excellent. My top taste testers (husband and sister) said it was one of my best loaves of banana bread. I made this exactly as the recipe states without giving in to the temptation of adding in extra things like cinammon or nuts, and I’m so glad I did. This is a simple, pure loaf of banana bread that will disappear before your eyes. Ok, you have to put your ripe bananas into the freezer-whole. Then when you want to make smoothies that include them just take it out & cut off the peeling & waalaa the banana is perfect inside. No further browning & you do not have to add ice when you use frozen fruit. Genious! Holy yes, I’m making this. I adore pound cake, so once you said those words I was sold. This looks sooo moist! I slightly adapted your recipe and made some muffins… just delicious, melting in the mouth! Will post it on my blog tomorrow with a link to yours! Thanks for sharing this wonderful recipe! You are welcome! Glad you liked the bread! I can’t wait to try this recipe! Any idea how it would be if i just used 1/2 cup sugar instead of 1? Maria, I had to give you a quick update: my Dad requests this banana bread each week, and his little Maltipoo puppy always lets us know she wants a taste too! Yay! Glad you like the banana bread! How do you think this would taste with some fresh blueberries added? I want to make this, but also have a container of fresh blueberries that need to used before they turn soft. I don’t want to mess with a good thing and this buttermilk banana bread sounds yummy! This is unlike any banana bread I’ve seen before! It looks so light (but incredibly decadent). 🙂 Want a slice right now! Wow we just made 3 loaves of the banana bread. They turned out beautiful! I just took the bread out of the oven. Were the measurements correct? The Banana Bread have no flavor, is gummy; and not light at all. What of waste of food in today’s economy, which could have been used for something else. I loved the pictures though. I made two loaves of this last week. One using the recipe exactly and one I added walnuts and chocolate chips. THE best banana bread I have ever made. Everyone at work was drooling and asked me to make more, more, more! This is baking in my oven right now and it smells AMAZING! I sprinkled the top with unsweetened coconut, pepitas, sunflower seeds, chia seeds, and a bit of raw sugar too 🙂 Love, love, love your blog! Thank you! Enjoy the bread! I made this yesterday and its so yummy! Moist and banana-y without being too sweet. I cut the recipe in half, and it made 6 muffins – perfect for just me and the husband! Also threw in a few fresh blueberries in the batter. Delicious, thanks for the recipe. I just made two loaves of this banana bread today and I think it’s the best banana bread I’ve ever eaten! I added walnuts and it was perfect. I had no buttermilk, so added one teaspoon of white vinegar to regular milk and let it sit until a skin formed on top. I believe lemon juice will work also. Since I wanted two loaves I doubled the amount of milk and vinegar as well as the rest of the ingredients. I would add 1 cup. 4 tablespoons of buttermilk? The recipe sounds good but I can’t see how that little buttermilk imparts much of that tangy flavor. Just finished making in cupcake tins, cut muffin in half put butter and cinnamon in….. OMG. Put cinnamon in mixture before baking. MAKE THESE. Funny! I bought a 1/2 gallon of buttermilk when I was doing my Christmas baking. It wasn’t until I got home that I realized my mistake (I wanted a quart), so we had buttermilk everything. I made four batches of buttermilk pralines, 2 buttermilk pies, a loaf of buttermilk bread (I’ll have to try your recipe for banana next time), buttermilk in the mashed potatoes and buttermilk in my potato salad dressing. I used the entire 1/2 gallon and was so proud, as it’s something I’ve never done before! Thanks for sharing! Believe it or not, I have never, ever purchased or used buttermilk in any of my recipes and I love to bake! I’m curious….does using the 4 tblsp of buttermilk really make a difference….or could you get away with using regular milk? If you don’t have buttermilk you can try regular milk. It should be fine. This sounds really good and easy! Thanks for sharing the recipe! What would you adjust the cooking time to if I was planning on making muffins? I use buttermilk to make pancakes, waffles and cupcakes. I also marinate chicken in it. Just made this! Hubby loved, loved it. So moist and delicious. Followed the recipe exactly. Maybe next time I will add walnuts. This recipe is a keeper. After all, what better way to use overriped bananas. I baked this yesterday. Very moist and tasty. Thanks for the delicious recipe! Hi.. Is it the same time and temp for the muffins? Same temperature, but reduce the time. Check them around 15-18 minutes to be safe! I just made this banana bread today and it’s amazing! The buttermilk really does the trick in this recipe. I made two loaves – one with chocolate chips and one without. Both great. Thanks for the recipe! What about using coconut milk or almond milk? Anybody done that before? It sounds interesting…. And, you can freeze buttermilk??? Never knew that! Coconut or almond milk will work! Just made this tonight. Followed recipe exactly, but after tasting battet, it seemed kind of bland, so I mixed in about 1/2 tsp cinnamon. Bread tastes good, but a bit bland. Next time will add 1 tsp vanilla & 1 tsp cinnamon. Walnuts would add flavor, but I don’t care for them in any baked goods. Will this recipe hold up if I add nuts? have been making a wonderful banana bread for years with sour cream; but love cooking with buttermilk, so will try yours. It makes a lovely crumb. Our fave soda bread is made with buttermilk. Could you substitute applesauce or Splenda for the sugar,my husband is diabetic. I never bake with Splenda, but I am sure it would be fine if you like that substitute. How many muffins would it make? This sounds tasty! Hi! How can you make buttermilk from scratch? In my country, I don’t think stores sell buttermilk in groceries. Thanks! Combine milk with white vinegar or lemon juice. I was intrigued by the buttermilk ingredient and like banana bread. I looked at the comments and some one suggested less sugar, which I did about 3/4 of a cup. Added some toasted walnuts and cinnamon, about 1 teaspoon. The cake was moist and dense. Not too sweet. Gr8 receipe. I have been wanting to make this recipe for weeks; I just could never get around to it until today. It has to be the best recipe for banana bread that I have ever made. I kid you not. Not only was it moist, fluffy and tender, it had a rich buttery crumb (just like yours). I doubled the recipe (minus one banana) and it yielded three huge loaves. I was so impressed with how well it turned out that I gave a loaf to my nex door neighbor. This will be my go-to recipe for banana bread from now on. Thank you! This is a easy recipe to make more like a banana cake instead of bread recipes I love love it. Bread. Why did this happen? Very disappointed. When bananas get overripe and speckled instead of throwing them away, I simply toss them into the Freezer, skin and all. The skins will turn black but the insides will be creamy white. When ready to bake bread or cake just leave them out for an hour. Thus recipe is very easy to make. I made muffins instead of bread. Cut the baking time to 17 min. I made this today. I will never make another banana bread. This is IT. Amazing! I didn’t have buttermilk, so I used plain kefir. Amazing. Simply amazing. Did I mention amazing? So glad you liked the banana bread! Thanks for letting us know! Freezing then thawing the bananas gives them a syrupy texture that makes the loaves so moist! I also put pecans in the bread ! I will try your s also ! THANK YOU ! How long you have to bake if you use mini loafs? It’s probably not the same time as when you use regular ones. Hi Yelena – The batter should fit nicely into three 5-3/4-in. x 3-in. x 2-in. loaf pans. Bake at 350º for 35-45 minutes or until a toothpick inserted near the center comes out clean. Cool for 10 minutes before removing from pans to wire racks. Could you cut down on the sugar or use honey/maple syrup instead? One of the best banana bread recipes I’ve tried. My husband didn’t even believe I’d made it…. My go to banana bread recipe. Turns out excellent every time. This time added a splash of dark rum. 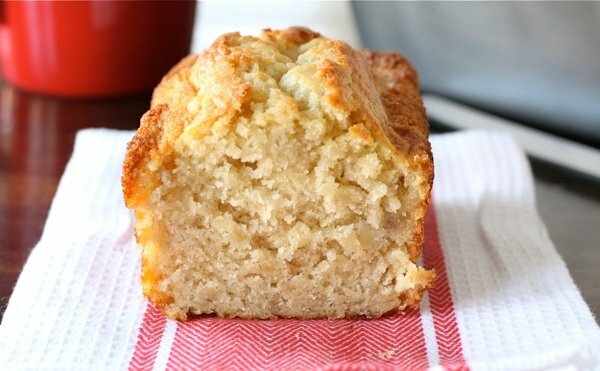 I have baked banana bread for over 30 years and this one with buttermilk is the absolute best . Although I prefer not to use over ripe bananas, excellent recipe. This is, by far, the best banana bread recipe I have ever made. It is moist, has a great flavor and a crisp, buttery crust. I have given this as gifts during the holidays and everyone raves about how great it is. Make extra, because it disappears fast! So happy you liked the bread! My daughter and I made this banana bread. It was so good. Followed the recipe, but only had 2 bananas, it still was delicious. Thanks. I have always used my fail safe receipe for banana bread, but found this one and decided to give it a try. I made a very large batch and, after trying it right out of the oven, I feel confident that when I give this as a gift as intended, it will be enjoyed as much as I enjoyed it. 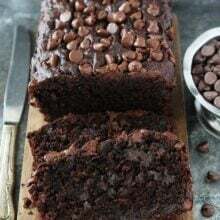 Although my family loves my banana bread, YOUR banana bread looks amazing and just the way I like it: light in color and super moist! Your images are stunning! Can’t wait to try it! 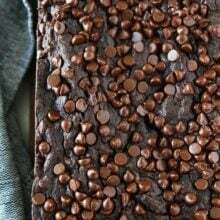 Do you use metal or glass loaf pans? I used glass and it took longer to bake. I researched it and apparently you want to use metal for breads. The article I read said it takes less time and a lower temp, but that’s not what I found. Next time I’ll use metal. Is this bread freezable after being baked? I made this moist and wonderful bread this weekend.The whole family loved it. My banana bread always come out flat with a dip down the center! I use buttermilk and baking soda. Any ideas? Could my loaf pan be too big? Thank you! I make recipe similar to this, but not identical. Mine does not have the baking powder in it. My banana bread always comes out dark brown around the edges and sides no matter what. I don’t use cinnamon and I don’t use brown sugar. Your banana bread is the only banana bread I have seen come out perfect. Please let me know what type of pan you use. Thank you! Do you have a dark pan? Use a lighter pan. I use an aluminum 9 x 5 pan I bought from Williams-Sonoma that’s supposed to be good. It’s not dark. Just wondering what type of pan you use? how far up the pan do you fill the batter? Halfway , two-thirds of the way? The recipe I make that is similar to yours fills my 9 x 5 pan up about 2/3 . I’ve never had a banana bread come out with such a light color as yours and I would like to have that happen to mine! Thank you for getting back to me so quickly! Made the bread last night. For the first time ever I had a banana bread that was cooked evenly through and through without being dark around the edges and light on top. Thank you for this delicious recipe! DELICIOUS!! THANKS FOR THE RECIPE! Made this tonight and it’s totally fabulous (even the batter was awesome). Added in 1/2 cup of mini chocolate chips and sprinkled a little raw sugar on top. This sounds amazing and I am going to cook this tonight. I’ve tried your recipe with bananas and it’s delicious. I have a lot of extra peaches right now. I just tried your basic recipe with peaches instead of bananas. I coarsely mashed 3 pealed, chopped peaches to get about one and a half cups of peaches. I added an extra quarter cup of flour and I reduced the buttermilk to 1/8 of a cup. I also added a quarter teaspoon of cinnamon. I tasted it after it had cooled about half an hour so it was still warm . It is delicious. Thank you for the basic recipe. I just love that this banana bread is NOT brown! It’s a beautiful loaf. Thank you! We buy powdered buttermilk. Buttermilk does last a long time, but I wasn’t using it quick enough. Powdered lasts forever. You can reconstitute it if your recipe calls for liquid. It’s by Saco. I made this recipe for the first time and enjoyed it. My family ate a second slice. This has become my go to recipe..so moist. Thank you for sharing. Made a triple batch today..some to give away. So good! Have made some of the other banana breads on this site (which are all excellent) just happened to have bananas and buttermilk. Kids and I gobbled it up. A definite must make! 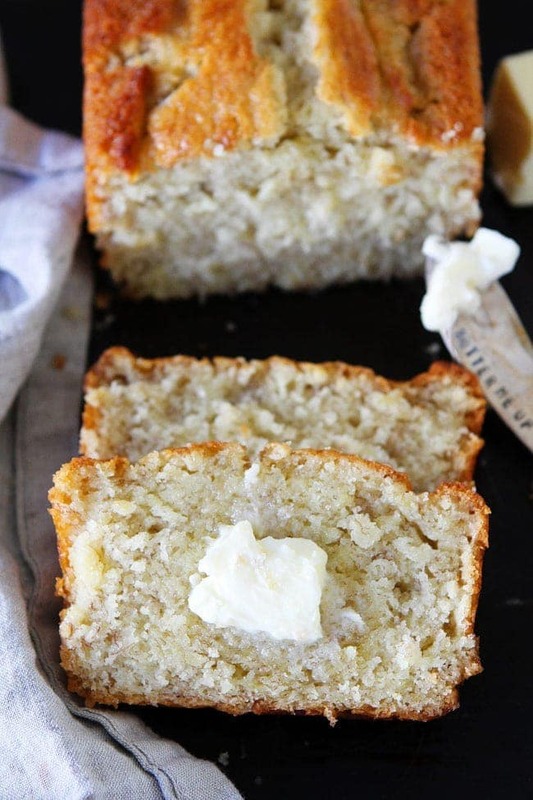 Woah I never would have thought about doing a buttermilk banana bread, this looks awesome! I bet the tangy flavor is a nice balance to the traditional sweet banana notes found on other recipes. I LOVE this recipe. I’ve made it quite a few times and substituted organic coconut sugar for granulated and topped the bread with minced coconut… this time I cut the sugar in half and added date crystals… yum! Just sooo simple and sooo delicious! Also as muffins! I wonder if i could substitute half of the flour with whole wheat? Update. I did use half whole wheat flour and it was delicious! Thank you for the recipe! I’ve never used buttermilk in Banana Bread before, so yummy and such an excellent way to use it up!